sarahkatebranine: The Shirllow DIY . I know what you're thinking: what in the world? Look on the bright side, this post could have been titled The Pillirt. (smile) One of my husband's greatest gifts to me is his sense of humor. Just the other night, as we laid in bed way past our bedtime, I laughed until I cried at the things he told me. I told him before drifting off to sleep, "I love that you make me laugh". So, when I asked him to put together a little video tutorial for this post, it was no surprise to me that he came up with an ingeniously funny name to go along with it. 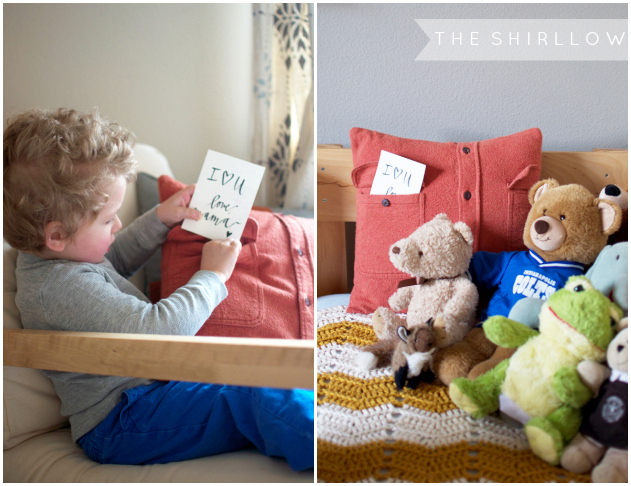 Enter The Shirllow: a shirt made into a pillow. I made this little shirllow for my Graeme-bear. I envision little love notes, lost teeth, tooth fairy money, and so many other things filling it's pockets in the coming months and years. I see a few more shirllows in my future. You? 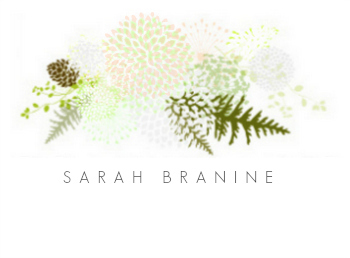 The Shirllow from Sarah Kate Branine on Vimeo. Graeme recently learned to recognize the written shorthand for I love you, which made this first shirllow love-note even more special for him. And, speaking of my husband, here's that beautiful video I hinted about on the Cranny + Me facebook page earlier today: how to make a pillow from a button-down shirt. Happy shirllow making, wink! Definitely an original name! My mom used to make these for us out of a favorite jacket or shirt that we had grown out of. True, there's nothing new... however, each new generation needs a new reminder, I guess. You'll resurrect the "shirllow" idea with a modern fun twist and throngs of people won't know the difference! Hi! That is great-- and those are the same pens that I used when I learned too! I have a different one that I pull out for Etsy orders, but I love the ease of the one in the video. I'm so glad that you're learning calligraphy! Do you like it? The sweetest pictures, video + words. Thinking my littles each need a Shirllow of their own. xo. And I would love to see them! Thank you so much for your kind words. I tell you what-- I still cannot get over those beautiful newborn pictures of your little one along with your sweet family all huddled around. I hope you are getting more and more rest as the weeks go by! This idea is so wonderful and the video was super sweet. I'm a new follower and have fallen in love with your blog!! My husband and I don't have any little ones yet but I will most definitely be making a Shirrlow of our own to sneak in little love notes to each other. Thank you for sharing this!! Absolutely! You are very welcome : ) Thanks for letting me know and for your kind words!